GGHK Editors Note: Eating local, seasonal vegetables has numerous benefits for both our health and the environment. We benefit from fresher vegetables that are more nutritious and contain fewer pesticides. Cultivated in the right season, plants grow more vigorously making them less susceptible to pests and diseases. By eating seasonally, we can help conventional farmers reduce their use of harmful chemical pesticides. Our usual leafy greens: lettuce, spinach, pak choi, choi sum and kai lan are cool season crops that don’t grow well in the summer. The article below was contributed by Joshua Keil, a registered dietitian, with a special interest in food security, and community health. Joshua has experience working with groups and individuals to achieve their nutrition goals in a wide range of conditions including chronic illness, weight loss, and general healthy eating. 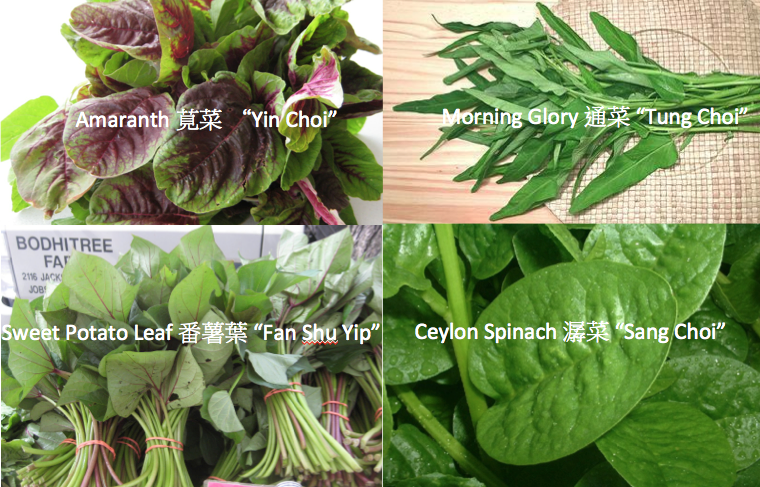 Ceylon Spinach, Amaranth (aka Chinese Spinach), Sweet Potato Leaf, and Morning Glory (aka Kangkong) are all dark leafy green vegetables that can be grown in the hot Hong Kong summer. Like many leafy greens, they are very nutritious and should be included regularly in your diet. All are great sources of Vitamin A, which helps maintain healthy skin, hair, and tissue, improve dim light vision, and new cell growth. Magnesium is another mineral these plants contain in abundance. It is important in maintaining healthy bones & teeth, maintaining nerve function, and recently has been found to play an important role in blood sugar regulation. Finally, folate is found in large quantities in all of these vegetables. It can help maintain normal digestion, and is crucial in red blood cell production. Folate deficiency can lead to fatigue and anemia. We should note that spinach and amaranth (both belong to the same plant family) have popularly been labeled as good sources of iron and calcium (thanks Popeye). However the presence of oxalates, especially in amaranth, make absorbing these two minerals very difficult. You should not rely on these vegetables for these two important minerals, but these plants are still packed with nutrients and should be eaten often. Nourishing the body through food, is a proven way to improve skin health, and overall wellbeing. Skin care, and other cosmetic products, promise results, but there is very little scientific research to back up those claims. Dark leafy greens, and other fruits and vegetables, provide a wide range of nutrients that keep our bodies healthy from the skin inwards. Another advantage of consuming these vegetables during the summer months is that they are good replacements for more common Chinese greens, such as Pak Choi and Choi Sum, that are imported from mainland China, where pesticide use is out of control. According to a 2013 Greenpeace report, Mainland China uses more pesticides than any other country in the world, and produce analyzed from several grocery stores contained up to 10 different chemicals on a single item. Being able to purchase local, preferably organic, produce can help us avoid these toxic chemicals. Since these four vegetables can all be grown locally in summer, it is much less likely they will contain the cocktail of pesticides that can be found on some mainland produce. Even better, seek out farmers that grow food organically, meaning that they don’t use any chemical fertilizers or pesticides. So go to your local wet market, a farmers market, or seek out a nearby farm and try them out! Below are some simple delicious recipes using these four greens, if you have any other ideas on how we can make best use of these veggies please share! Previous Previous post: Water for Free~ Android app is now available for download! Next Next post: Economic Growth is Good…or is it?